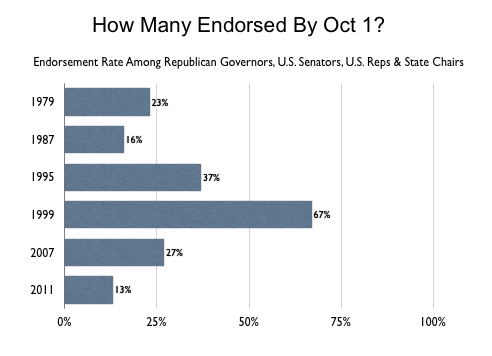 The recent endorsements of Mitt Romney by New Jersey Gov. Chris Christie, Mississippi Sen. Thad Cochran and others, have some questioning whether endorsements matter, and others buzzing that that Romney has become an "inevitable candidate." But an analysis by the Huffington Post shows that the current rate of endorsements for all candidates, Romney included, remains behind the pace of the last five contested Republican nominations. Christie's nomination may serve as an important signal to Republican insiders, but by the yardstick of modern campaigns, the Republican party establishment is far from a consensus. Many of the major officeholders that traditionally endorse a presidential candidate are still on the sidelines. Few elected officials can "deliver" votes in the manner of the mythical party bosses who controlled large blocks of convention delegates. But political scientists have demonstrated that endorsements by party leaders and activists are an important indicator of the state of consensus on a presidential nominee. And while an individual endorsement may not swing many votes, a larger pattern of endorsements can send a message about whether a candidate has what it takes to win the general election and serve as president. In their book, "The Party Decides," political scientists Marty Cohen, David Karol, Hans Noel and John Zaller found that a candidate's share of endorsements just before early primary elections is often a better predictor of the ultimate nominee than early polling. This year, however, the pace of endorsements is lower than the last five Republican contests. Our tally finds that as of Oct. 1, just 13 percent of Republican governors, members of the U.S. Senate and House, and party state chairs have publicly endorsed a candidate for president. The rate falls far behind the pace of endorsements as of the same date in previous Republican nomination battles. While the nods to Romney by Christie, Cochran and a handful of others have nudged the current overall endorsement rate as of this writing up to 14 percent, it still lags behind the pace of past contests as of Oct. 1. Unlike the authors of "The Party Decides," we did not examine endorsements made by other party activists at the local level, but we did tally the public endorsements made by the 250 local Republican activists, party leaders and elected officials that participate in the weekly HuffPost-Patch Power Outsiders survey. As of Oct. 1, just ten percent -- 25 of 250 -- had made a public endorsement. This pattern of indecision matches the attitudes of rank-and-file Republican voters. The latest CBS News poll, for example, found in early October that although many Republicans can name a candidate they are leaning toward supporting, only 19 percent say they have their minds made up. Three out of four -- 76 percent -- say, "it is too early to say for sure." Since 1980, as shown in the chart below, every leader in the endorsement race at this point in the Republican contest has ultimately won the nomination. The 2008 race is a possible exception, although in that year endorsements were a better gauge of McCain's strength than national public opinion polls. As of Oct. 1, 2007, Sen. John McCain (R-Ariz.) and Mitt Romney were tied in their raw number of endorsements from major officeholders -- 30 percent each of all such endorsements -- with former New York Mayor Rudy Giuliani close behind, with 25 percent. McCain had a razor-thin lead over Romney -- 35 to 34 percent -- and Guiliani trailed, with 21 percent -- in all endorsements at all the levels gathered by the authors of "The Party Decides" (and applying their weights by the political importance of the endorser). As the authors wrote, "The Republican field had no candidate acceptable to all wings of the party." However, at the same point in 2007, most national surveys of Republicans still gave Giuliani a wide lead over both McCain and Romney. So the endorsements were more telling than the polls. 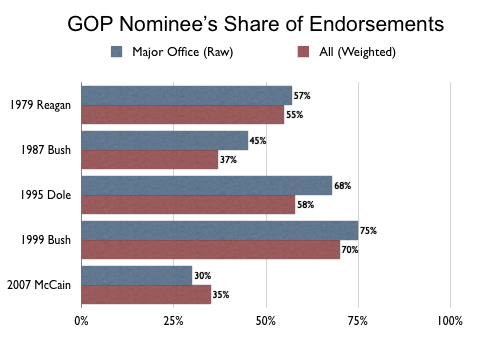 Currently, Romney wins a substantial share -- 47 percent -- of the endorsements made among the major officeholders we examined, followed by Rick Perry (28 percent) and Newt Gingrich (13 percent). Romney is also the choice of 10 of the 25 Power Outsiders who have made public endorsements. But again, since the the overall pace of endorsements has been slow, Romney's aggregate totals are low. In fact, as of today, we count just one more endorsement for Romney from governors, senators, House members and state chairs than he had at this point in 2007. Georgetown political scientist Hans Noel believes the current state of the Republican nomination is similar to where the Democratic contest stood in 2004. At this point in 2004, national polls showed a close contest, with Howard Dean and Wesley Clark typically leading over John Kerry and Richard Gephardt, but with no candidate receiving more than 20 percent of the vote. Endorsements were nearly evenly divided between Dean, Kerry, Gephardt and John Edwards. "The [Republican] party really wants to win," Noel wrote via email, "but they don't have a good candidate who can unite the party." He argues that Romney, like Dean, has, "serious flaws, as far as the party sees it, but who could be better? The 2004 Dems had a few likely second choices (Edwards, Kerry), and the 2012 Republicans also have some choices. But this is why they are still trying to find another candidate." Romney fares better in the endorsement race at this point than Dean did in 2004, but the implications for the outcome are still unclear. Only one thing is certain: The party has not yet decided.